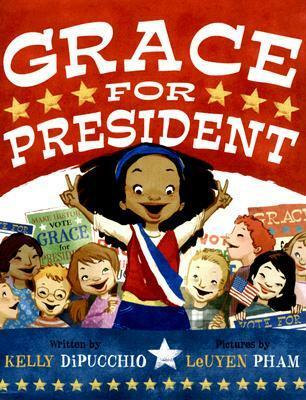 Grace for President by Kelly DiPucchio and illustrated by LeUyen Pham. Hyperion Books for Children, 2008. Currently Available. Face Value: LeUyen Pham is one of my favorite illustrators ever. I love the joyful, expressive way she draws kids. And this cover perfectly captures the book inside: Grace is at the forefront, looking terrifically presidential, with a diverse mix of supporters behind her. It’s a beautiful reminder that someday we’re going to have a black female president. Does it Break the Slate? Well look at the cover. This book shatters the slate before you even crack the spine. The slate is destroyed by page 3, and I dare you not to tear up a little bit at the last panel. 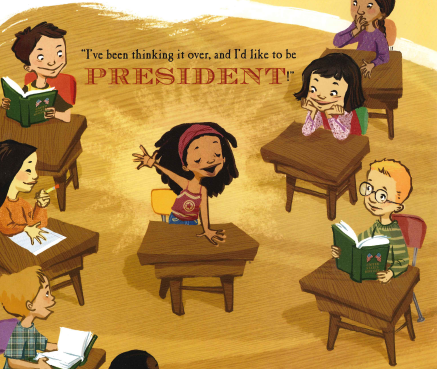 This is a book that makes a black girl president. It makes her a great candidate, smart and capable, who has to fight hard to be respected. It uses historical and political facts and it acknowledges systematic oppression with an absolutely inspiring ending. Who would we give it to? I would give this to every early elementary school teacher I could find. Read this during election season for a book that empowers all kids to be active in their communities while giving solid facts about how our political system works. 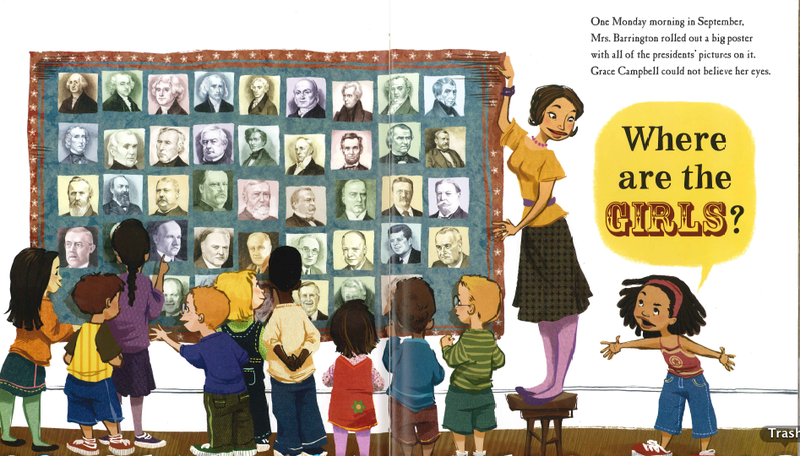 Review: When Mrs. Barrington unrolls a poster of the presidents, Grace Campbell can’t believe her eyes. The story, of course, is inspiring. But one of the most important things, I think, is how rooted in the actual political system it is. We, as a society, don’t know enough about how our electoral process works, and this book explains a lot of it in a way that is neither confusing nor condescending. 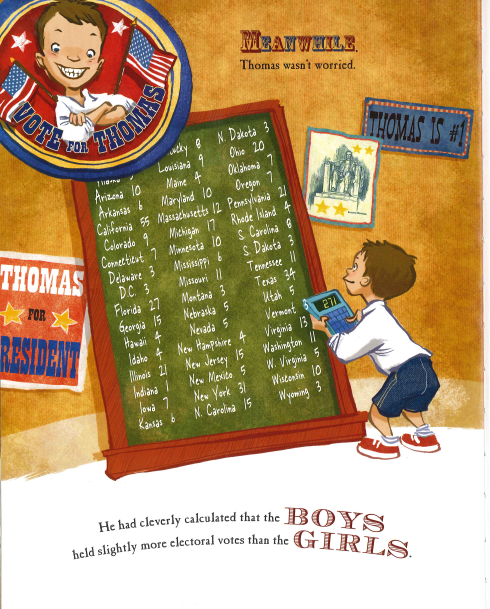 DiPucchio’s story, paired with Pham’s illustrations make for my all-time favorite election picture book. 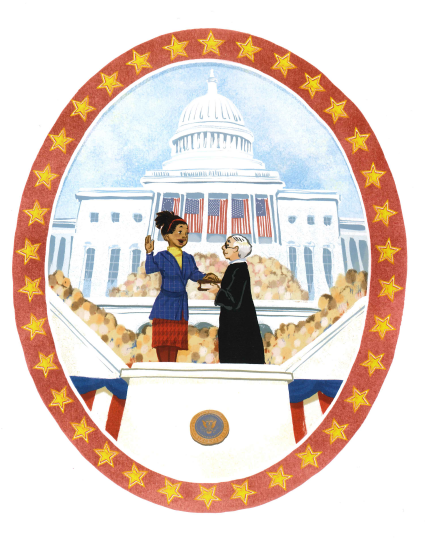 This entry was posted in Picture Books, Reviews, Theme Week and tagged Democracy, Election Week, Elections, Feminism, Picture Books, Politics, Presidents. Bookmark the permalink.